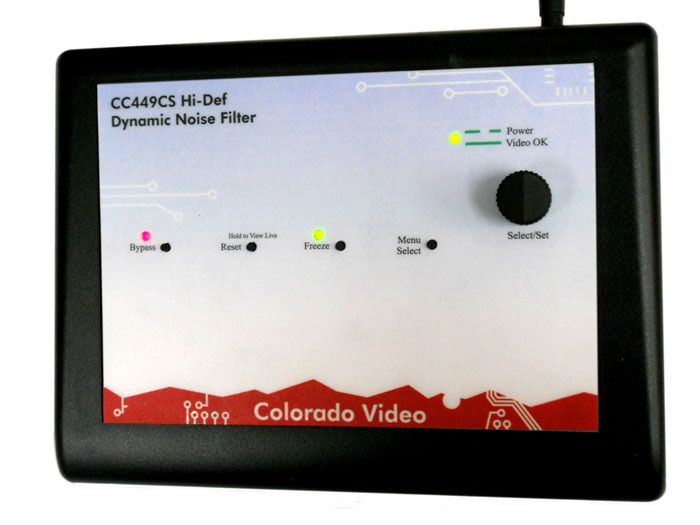 The Colorado Video Model 449 Series Dynamic High Definition Video Noise Filter can average and therefore filter or reduce dynamic video noise (like "snow" or "static") out of a hi-def video signal by essentially averaging frames over time. This type of video noise filtering or reduction is best suited for signals with rapidly changing noise in pictures of relatively static (unchanging) subjects. where Pn is the value of the pixel in the current output frame, Pi is the value of the pixel in the current input frame, Pn-1 is the value of the pixel in the previous output frame, and t is a user selected time constant. This equation is solved for each pixel at the full input video frame rate. As the user selects larger values for t, the exponentially decaying influence of a given pixel's value in a particular input frame will persist over a longer period of time in subsequent output frames. The Model 449 Series allows filtering of 1x to 32,768x (in steps of powers of two), on a running basis.